French crepes are actually something that is celebrated every 2nd of February. 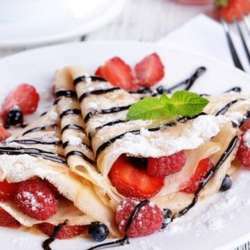 It is a day where every french home will make a good dozen of lovely crepes to eat together. It is believed to be for the return of the light (spring is coming and no more long winter nights ahead) and it is called "La Chandeleur". *** You usually eat them salty as a main dish (with egg, ham, cheese, etc) and/or sweet with fruit, sugar, jam, etc. spread on the top as a dessert so that you do not overpower the natural taste while drinking some bubbly apple cider of the same region. We will ONLY cook SWEET ones this afternoon. Needless to say that it is a delicacy of the poor. Nothing very posh. But in cold nights, with a just egg, milk and rye flour, it was the best they could afford to keep warm. Finance participation of each attendee around 10 euros to share cost. Parity men/women would be great but not mandatory. I will send the exact address via mail to all attendees the day before. Please note this is a small event which includes involvement by the attendees to prepare and clean after. Please respond to messages I send to you. I rely on you to not cancel on short notice. Experience showed that people on the waiting list usually do not jump in even if you cancel the day before.